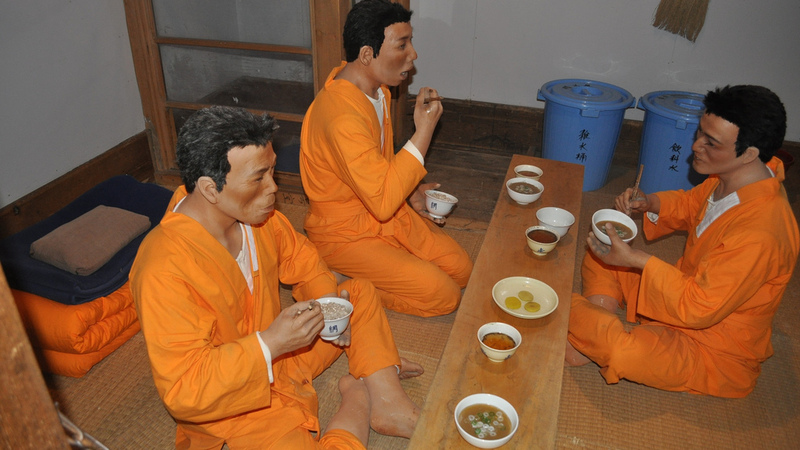 Japan's recently expanded prisons are already at 70% occupancy, an incarceration epidemic blamed on hungry pensioners who account for 35% of the nation's shoplifting, with a high rate of re-offending. Japan's state pension of ¥78,000 (USD6,900) is at least 25% below subsistence, and prison sentences for property crimes are harsh -- a stolen sandwich can result in a 2-year custodial term at a cost to the government of ¥1.4M. Japan, like many developed states, is in the midst of a demographic crunch: the richer a state is, the better its pension system and the lower its overall fertility. This means that each generation of retirees depends on a smaller generation of workers to support its pensions. Japan's crisis is badly exacerbated by runaway xenophobia, which makes immigration reform a no-go area. Without a cohort of young workers from elsewhere in the region, there are just not enough people paying into the system to support the aged. This problem is in turn magnified by the need of young, productive workers to divert themselves from waged work to look after their elderly parents, which has the double effect of reducing their ability to support children (who will provide the labor to support their pensions) and reducing the present-day tax-base, increasing the pressure on yet more elderly people and thus more young workers. Japan, like the UK and the US, is crippled by its misperception of migration by young workers as a burden on the state, rather than a benefit to it. As the demographic crunch of a too-small cohort of young workers working to sustain the medically prolonged lives of their parents and grandparents makes young workers even more desperate (a situation that is made much worse by the unethical housing bubble that converts shelter from a human right to an asset whose "value" must be increased at all costs), they blame the young workers from abroad who "compete" with them, failing to see that these workers are needed to sustain a system designed on the premise that working generations will outnumber the retired. Populist politicians -- Abe, Trump, Farage, etc -- blame migrants (rather than the rich rentier investors) for the crisis, and win popular support, pushing mainstream parties to denounce the migration that's keeping their countries solvent. Meanwhile, the elderly live in fuel poverty and food poverty, and the state ends up paying a huge premium to rehouse them in prisons or hospitals, and another, hidden premium when their children are taken away from productive work to a desperate struggle to save their parents from misery. "The social situation in Japan has forced the elderly into the need to commit crime," he says. "The ratio of people who receive public assistance is highest since the end of the war. About 40 per cent of the elderly live alone. It's a vicious circle. They leave prison, they don't have money or family so they turn immediately to crime." The crime figures, he adds, expose the strained calculus of the government's welfare spending as the world's second-biggest economy ages. Prison, no matter how the spreadsheets are run, is a woefully inefficient way for the government to target welfare spending at those who most need it.